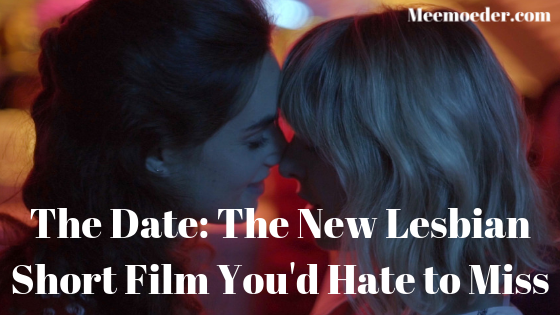 I watched a new lesbian short film called The Date and I can’t wait to share with you how awesome it is and how soon you should watch it. It is the happy modern love story we have been waiting for. I have seen many short films this past year but none of them made me feel as happy as this one did. Okay, I am coming out right from the start: I am biased. Writer and director Emma contacted me online to talk about the movie. We had some fun conversations and were able to meet at ClexaCon London. I now call her my friend and naturally, you want your friends to succeed. So, there you go, that is my bias. However, do you know how sometimes friends ask you to share something and you’re not really a fan but you share it anyway because that person is your friend? Well, that was completely not the case with this film, fortunately! I tweeted about the Indiegogo campaign quite a few times and was happy to see the movie got funded 113%. The reason I wanted this crowdfunding campaign to succeed is that I was able to receive a sneak peek of some footage and I could immediately tell it was the good stuff. I knew this short was going to be of good quality if they just had the funds. Can you imagine how nervous I was when I was finally able to watch it?! By the way, it is not just Emma’s work. Hansof Waller was a great help writing the script. “The Date is the story of two women looking for love in the dating world of the 21st century. Lizzy and Olivia might be total opposites when it comes to careers and dress sense BUT they do have one thing in common… They both swiped ‘right’ on each other. After swiping right, the two hit it off almost immediately but there’s still one thing left to do: meet. In this day and age, where meeting new people happens mostly online, we wanted to write a story about the good relationships that come from online dating. The dialogues in this short film are sooooo good. You know how some short films try to be as artistic as possible and make the characters say these really special lines to showcase how intellectual the creators are? That is not the case in The Date. The Date shows the date you can have. The characters make the jokes you would make. And they have the exact same insecurities as you and me. Is this next date going to be as bad as the previous one? Will she be who she says she is? Will she be a serial killer? Am I going to be stood up? Nope. This is a happy movie. You know, the one we do not always get. What can I say about their chemistry? You will feel it. Big time. And you will want them to end up together. The Date reminds me of when my wife and I just started dating. We often went clubbing and loved dancing together. So, seeing their first date start with dinner and end with dancing brought back so many good memories. My wife and I actually watched this movie together. I sometimes looked at her to see what she thought of the movie and she had happiness written all over her face. She even grabbed my hand at one point. That is how this movie will make you feel. The editing tells you there is a highly skilled team behind this movie. I do not want to give anything away but the keyword here is delayed gratification. You will get it when you watch it. So, the credits actually play an important part in this movie. The movie is 9.5 minutes long and the credits are six minutes long. You will want to stick around for those six minutes because, in these credits, you will watch videos of real couples who met online. They tell you how they met and how happy they are. How brilliant is it to have actual people from our community participate in the project?! I greatly appreciated it and I loved seeing some familiar faces and names. It really takes a village to make such a project happen! Where can you watch The Date? Because the movie had a successful Indiegogo campaign, that page will continue to be open. That means you can still buy the perks that will grant you access to the movie before release. This way, you can support their project AND you will have the movie ASAP. Sounds like a good plan to me! In addition, their plan is to make a festival run before releasing the movie to the public. That means that if you want to see this movie ASAP, you will have to visit a film festival near you that will show this movie. Consequently, it would be wise to follow the movie on social media to see when and where this will happen. This is their Twitter account and their Instagram page. Want more tips on what to watch? How about Different for Girls or Anne+? Subscribe to my YouTube channel to hear my tips the moment they are uploaded!